Synology uses a common operating system for all its NASes. I did a full review when DSM 5.0 was released a little over a year ago. Synology has since upgraded DSM several times, and the version used for this test is 5.2-5592 Update 4. A list of DSM 5.2's updated features can be found here. Unfortunately, the link that used to take you to a live demo of DSM now takes you to a page full of tutorials. While there are lots of tutorials that contain good information, there's nothing like a live demo that lets you play with some of the features and explore the UI. Since there's no live demo to try out, I created a couple of screenshots on a Synology NAS currently running in my office. It has been upgraded to the same firmware as tested. Firmware version 5.2-5592 Update 4 was loaded onto the DS2015xs and performance tests were run using the Revision 5 NAS test process. All tests were run using four SNB-supplied Western Digital Red 3 TB (WD30EFRX) drives. I filtered the NAS charts for the latest testing method (black bars) and RAID5. The composite image below shows the benchmark results for File Copy Write Performance (left) and File Copy Read Performance (right). For many NASes, performance is limited not by the ability of the NAS to handle a heavy load, but rather the limit of Gigabit Ethernet and a single client. Many of the test results for File Copy Read and Write were between 109 and 110 MB/s - about the maximum you can achieve with Gigabit Ethernet. For File Copy Write, the DS2015, at 109.7 MB/s was just a very small percentage behind the chart topping 110.1 MB/s. For File Copy Read, the DS2015xs performance was 106.2 MB/s compared to the fastest throughput of 110.1 MB/s. Keep in mind we treat results within 5% of each other as equal for ranking purposes. So there is really no significant difference among products with results in the 105 - 110 MB/s range. You can tell a lot more about performance by looking at the individual test results shown in each product's Benchmark Summary. For these comparisons, I've created two composite images that show the summaries for the Synology DS2015xs and the QNAP TVS-471-i3-4G. The first image shows the test results using a Gigabit Ethernet connection. The second chart shows test results using a 10GbE connection. We'll compare Gigabit Ethernet connected results first. For File Copy Write and Read, both products had similar performance, except the QNAP had lower throughput for RAID 0 and RAID 10 File Copy Read tests. In general, the DS2015xs performed better on the NASPT HD Playback & record, NASPT 4x HD Playback and NASPT File Copy To NAS and NASPT File Copy From NAS tests for all RAID levels. The TVS-471 tended to have better performance for NASPT directory copy to/from NAS, Office Productivity and Content Creation. The QNAP also outperformed the Synology for USB backup for all three file systems (FAT, NTFS and EXT3) as well as iSCSI read and write tests. The DS2015xs was significantly faster for Network Backup. Removing the limitations of Gigabit Ethernet by using a 10 Gigabit Ethernet LAN connection, you can start to draw better conclusions about performance. The image below shows benchmark summaries for the Synology DS2015xs (left) and the QNAP TVS-471-i3-4G (right) using a 10GbE connection. In general, 10GbE results trends tended to follow Gigabit results. For example, the QNAP tended to outperform the Synology for NASPT Directory copy to/from NAS tests as well as Content Creation. In some tests, however, the results were magnified by the faster connection. For example, the QNAP had about twice the iSCSI throughput as the Synology for both read and write tests. Table 1 summarizes File Copy benchmarks for RAID 0, 5 and 10 with Gigabit and 10GbE connections so you can see the difference the 10 GbE connection makes. We don't include 10GbE results in the NAS Rankings because not all products support it. And because we don't have many 10GbE products in the Charts, we don't have a separate Ranker for them. So to provide an idea of the DS2015xs' relative 10GbE performance, I updated the chart from the TVS-471 review that shows 10GbE File Copy Write and Read results for all RAID levels. We now have six products that have been tested with 10 GbE. Note we went back and got 10GbE results for the TVS-463 that were not in the review, by using the same QNAP 10GbE adapter used in the TVS-471. NETGEAR's ReadyNAS 716 still tops the charts for RAID 0 and RAID 10 for both File Copy Write and File Copy Read performance. Note that for both RAID 0 and RAID 10, File Copy Read performance is significantly faster than the second fastest NAS. For RAID 0 File Copy Read performance, the DS2015xs grabbed second place with 477.3 MB/s. It also turned in the fastest File Copy Read performance for RAID 5. Surprisingly, the ReadyNAS 716 had the poorest performance for RAID 5 File Copy Write and Read. It's worth noting again that the Performance Ranking takes into account only Gigabit Ethernet performance. For this review, I filtered for RAID5 class NASes and Revision 5 Test Method. The ASUSTOR AS7004T still retains #1 ranking based on performance. QNAP still holds on to rankings 2 through 4, with the Synology DS2015xs landing at number 5. The composite chart below shows detailed performance for the Synology DS2015xs and QNAP TVS-471-i3-4G. The QNAP TVS-471 had category wins for Write Benchmarks, Read Benchmarks, Mixed Read Write and iSCSI. Based on the individual benchmark tests above, it's no surprise that the DS2015 had higher category scores for Video and Backup. QNAP's backup category score was dragged down by the relatively slow Rsync backup. If you are in the market for an eight bay NAS, the options available start to dwindle compared to four bay NASes. 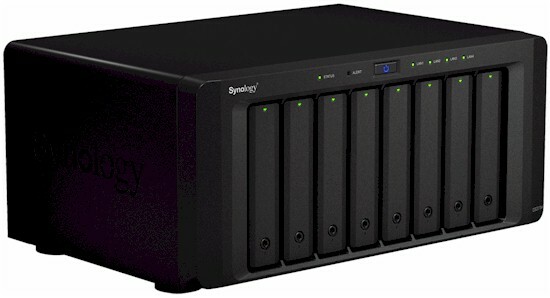 By choosing the Annapurna Labs AL-514 SOC with built-in 10 GbE support, Synology's DS2015xs has carved out its own market niche as an eight bay NAS with built-in dual SFP+ 10GbE ports for a very impressive $1400. But that price does not include some features found in its competition, specifically, an LCD panel and PCIe expansion, eSATA and HDMI ports. So just how much of a value is the DS2105xs? Competing for your eight-bay NAS dollars is the eight bay version of the ASUSTOR AS7004T - the AS7008T. On Amazon, the AS7008T averages $1855, and that's without the optional $499 10GbE dual SFP+ expansion ports. Similarly the eight-port version of the reviewed QNAP TVS-471, the TVS-871 sells for $1449, without the optional $429 dual port 10GBASE-T expansion card. If you can live with the compromises outlined above, the DS2015xs is hands down the best value for an eight bay NAS - even if you don't intend to use 10GbE. If you do intend to use 10GbE, the value proposition only gets better because of the included dual SFP+ 10 GbE ports. Your final decision might come down to how you intend to use the massive amount of storage potential offered by an eight-bay NAS. If iSCSI via 10GbE is your focus, you might want to pass on the DS2015xs. The chart below shows the DS2015xs ranked last for 10GbE iSCSI both for Write and Read by a significant margin.